Responsible land stewardship is a major goal at the Winecup Gamble Ranch. Through use of holistic management principles and conscientious management of our natural resources, we are able to sustainably produce quality cattle while maintaining a biologically diverse and resilient landscape. In turn, this land ethic ensures our natural resources will continue to flourish and be enjoyed for generations to come. The ranch is blessed with an abundance of pristine water in the form of hundreds of natural springs, multiple creeks and two large reservoirs. We use water from these sources to efficiently irrigate over 11,000 acres to produce quality forage for our livestock. In addition, the natural springs also supply clean water for our own use, along with the many livestock water developments and wildlife guzzlers placed throughout the ranch. Our grazing management practices are based on the use of higher-stock densities and short grazing periods. Rotating pastures more frequently and changing our seasons of use, combined with extended recovery periods, helps us to improve the health of pastures. Stock water developments placed strategically throughout the ranch is the key element to optimize grazing utilization and distribution, in turn contributing to improved rangeland health. This healthy ecosystem not only benefits our livestock but is of equal importance to the abundance of wildlife that shares it as well. On the ranch, we take an integrated management approach to weed control using pesticides only as a last resort. In 2016 we took our approach one step further, purchasing a herd of approximately 450 head of goats. Using this herd, we have began large-scale land restoration projects using prescribed grazing practices in more difficult-to-manage areas of the ranch. Along with goats, we have also used strategies such as rolling brush and strategic feeding of cattle to increase animal impact and improve soil health in problem areas with weed and brush encroachment. Greater Sage Grouse are a special bird here at the ranch and we are taking several precautions and efforts to preserve and enhance their habitat in conjunction with our public lands partners. 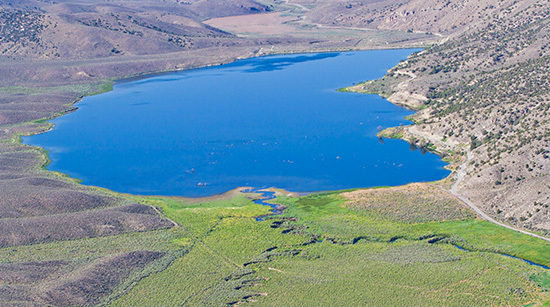 Working with the Stewardship Alliance of Northeast Elko County (SANE), a collaborative team made up of landowners, agencies, and stakeholders, our ranch has implemented several site-specific conservation projects to improve and sustain a healthy ecosystem for sage grouse and other wildlife.